Yes, you can make them way in advance, and some more, and enjoy all week the special look and flavor. This year I used a classic recipe using onion peels but also added a small beet. Next year I will add less onion peels and a larger beet. I love pink! All measurements are approximate. If you don’t have onion peels you can also use tea bags and or coffee. 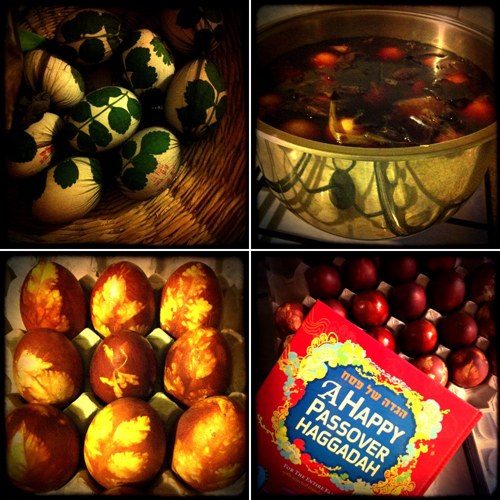 If you want to decorate your eggs, put them in stockings and press leaves against them as seen in the pic. Place onion peels in a large saucepan. Cover with water and some more and bring to boil. Lower heat. Add spices and carefully lower eggs into pan. Add more hot water to make sure all eggs are covered. Poor oil (it creates a lid) and top with the saucepan’s lid. Simmer for about an hour to get a nice color. You can also cook for longer, on small heat for stronger color and flavor of the eggs themselves. Unless they break, eggs can be kept for at least 10 days.